I Heart My Glue Gun: Giveaway! I see that I have new followers, and I am just estatic over it! HI EVERYONE! I am glad you found your way over here, and like what you're seeing! Can't wait till I'm back to my normal self so I can continue transforming our humble abode and sharing it here! In the meantime, let's do another giveaway! This time it's one of my FAVORITE painting tools, the Shur-line Edge Like A Pro edger!! When we first moved in here, I knew that I had alot of painting to do. I started with the guest bathroom, and quickly learned that even with painter's tape, the paint will STILL bleed on the ceiling and other places I don't want it to go! So I beelined to Home Depot, trying to find something that will eliminate this problem. That's when I came across my beloved, the Shur-line Edge Like A Pro. LOVE LOVE LOVE this little thing. Never get paint on your ceiling or baseboards AGAIN! Your lines are smooth and crisp, which is a MUST for me because freehand, I'm just AWFUL. I'm not afraid to admit it. Do you know how much time I save not putting up tape? ALOT! So now you have a chance to fall in love with it too! One lucky winner will receive this awesome tool that I PROMISE will relieve your paint woes! 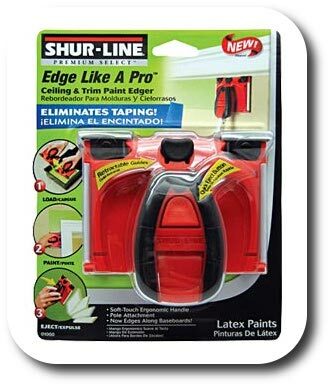 EDIT-The good people at SHUR-LINE have offered TWO Edge Like A Pro edgers, so there will be TWO lucky winners! WOOHOO! This giveaway will run until March 9th 11:59pm. Will announce the winners March 10th! I JUST spent all morning taping off my bathroom to paint! I would LOVE to win this...it would make all my projects faster & more fun! We bought a home and I have lots of painting to do...I would be happy to win. I'm a new follower, and I've enjoyed evry post so far!!! Count me in for a chance to win! http://chanandjess.blogspot.com/ And I blogged about the giveaway. Thanks for stopping by and joining the giveaway! I am now your newest follower! I definitely do lots of painting! Would love to have this. I'm a follower! I have my entire upstairs to still paint, not to mention all the stuff I want to repaint downstairs! I'm a new follower! It's great to find a craigslist lover. I find myself just browsing craigslist for fun, seriously! Anyway, I hope I win the paint edger, it'll be so fantastic the next time I paint! Hi Janet! I am a new follower. We decided to paint most of our wood paneling in our home so, this would be great for when we repaint or want a different color. I just had to follow your blog...I have a strange addiction to Craigslist, and I love reading your blogs..excited to see what will come next! I'm a new follower! We just bought our first home last year and I have yet to paint anything! I'm scared to death! This little contraption just might ease that fear! Such a great giveaway. I am a new follower! I hope you'll check out my blog too! Happy weekend! Just found your site and I'm loving what you do! We're closing on our first home at the end of the month and looking forward to all of my decorating (and painting)! so crossing my fingers on this one! Yay! I just found your blog and would love to win. I love this product! We used it when we painted our daughters room. That was the first time we ever painted in our life. I need one more to make life easier. Hi! I just became a follower and I'm envisioning all the things I could do with this tool! Found it...LOL!!! Love your fun projects!!! donnaself01@hotmail.com......found u on FB!!! I'm a follower. I have so many projects coming up that this would come in handy! I am a new follower but long time reader! I love your blog!